The violence in Chicago is ridiculous this summer, and we’re not going to spend any more time on that. Enough said. That said, we have this AMAZING, BRICK, AIR-CONDITIONED BUILDING beloved by youth and siblings RIGHT ADJACENT TO one of Chicago’s most homicidal police beats. We weren’t really planning on all these hours, but they’re beyond needed–so here is is, ya’ll. Summer in R CITY. There isn’t much grass around to be green and I can’t vouch for the prettiness of us girls, but it’s going to be glorious. Music, art, gardening, coding, and more for 40 adolescents and 12 their little ones who tag along with them. All designed by our own talented Young Leaders' Cohort. 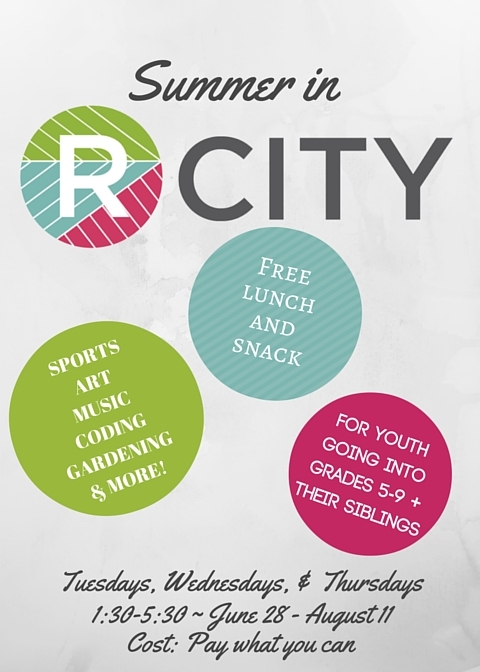 Register today at River City! All youth of the proper age are eligible. Volunteers can even bring their own wee ones grades K-4 if necessary, so think about it! Can you give an hour a week? One day per week? One week of the summer? Can’t volunteer? Send supplies through our Amazon wish list here!